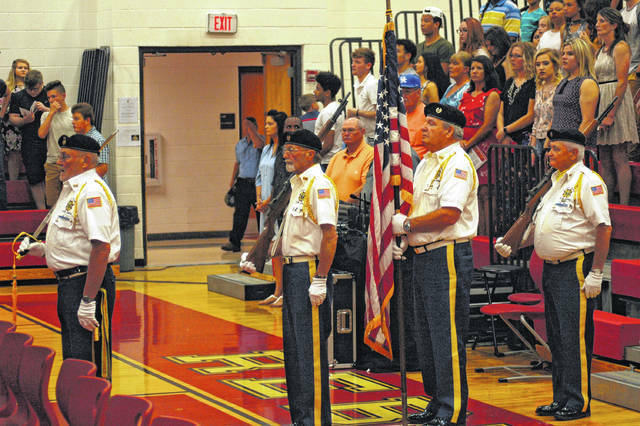 VFW 4464 Honor Guard presents the Colors in the South Gallia gymnasium. South Gallia received a letter from ODE in early December 2018 saying that the award was valid for two years before needing to be reconsidered again for the honor. The program started last year, said South Gallia Principal Bray Shamblin. Applicants go through four rounds of judging before being picked as a designee. Shamblin said he felt the school’s Purple Star Committee and its students were excited to continue seeing what more could be done in the future for veterans, while also reflecting on past progress.